Read more: Take the Time Tuesday: Food Under Foot! I had to write an update after my grocery shopping today! Remember I said just yesterday that sometimes people comment about the amount of produce we are buying? Well, a sweet older woman saw all of the bananas going into our cart and she asked, "What are you going to do with all of those bananas " You already know the response I gave: "Eat them!" One of the really nice workers at the food co op commented that he can eat about eleven bananas sometimes. I told him, and another friend we saw shopping at the same time, that I can do that now, too. 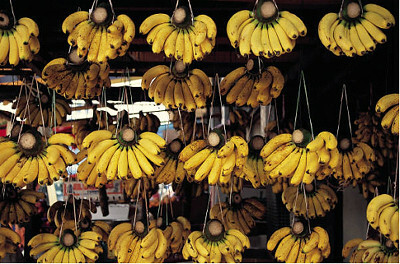 I explained how I used to get full on just one banana when I ate cooked foods. But, now that my system is so much cleaner and healthier, I can consume 10-11 bananas in a day (bananas should be covered with brown specks to truly be ripe and digestable). I don't remember the maximum I ever ate in a day--it's somewhere in my Going Raw journal, I'm sure. It might have even been more than 10 or 11 when I was going through my major banana-eating phase. Now I eat about 4-6 bananas a day, which doesn't seem like a lot to me (but in the past I would have wondered about all of those bananas in someone's cart, too!). Read more: What are you going to do with all of those bananas? I need fast & easy meal ideas (esp. breakfast & dinner) -- time is a luxury I don't have (taking 18 college credits, internship, PT job and I started a natural perfume business!). By the end of the day I am so exhausted that I'd rather not eat than go in the kitchen & try making somethin raw. If you're dealing with exhaustion or fatigue, we'd like to direct you to a recent blog post discussing the subject. As for time being a luxury, we address that, as well, in the same post. You'll always hear the same thing from us about limited time in relation to your diet: Make the time! Your overall health is what's most important in life and it's imperative that you arrange your life so that you have plenty of time to not only prepare healthy meals, but to also eat them in peace without feeling rushed. With that said, it's also important to realize that eating healthy doesn't need to take hours out of your life. There are plenty of raw food recipes that are not only quick and easy, but also packed with nutrition! We'll share, below, some links for some of our favorite recipes that are quick, easy, nutritious, and delicious! These recipes are located here on our blog.